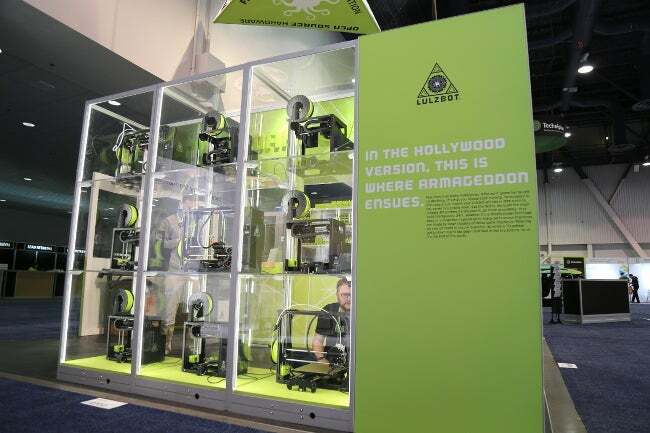 As a CES first, LulzBot 3D printers are being manufactured live on the show floor. It's no secret that Aleph Objects, by design, does not have trade secrets. As the makers of the LulzBot brand of 3D printers, our industry-leading transparency is born out of a passion for free software, libre innovation, and open source hardware. Every software tool we use to make our certified open source hardware is free software. Libre innovation encourages this kind of fanatical transparency, freeing us to share not only our bill of materials and internal assembly documentation, but even things like our research projects on our public development server. We confidently share everything that goes into our products—and more importantly, it lets us show you how they're made and how to get involved. This method of innovative manufacturing is not new—it's firmly rooted in the RepRap project, where an open source 3D printer prints components for itself and other 3D printers. Back home in Loveland, Colorado, our cluster of 155 LulzBot 3D printers operates 24 hours a day, seven days a week, to make 3D printed parts for the next batch of 3D printers. The cluster serves as a manufacturing and testing facility, reflecting the quality and dependability of the machines in the prints they produce. Prototypes are often tested in an industrial setting for real-world application and to maximize product reliability for the customer. From when the cluster began operating in 2011, it took nearly five years to print the first million production-grade parts. Since then, it’s only taken a year and a half to reach the 2 million mark—an indication of the increased efficiency and speed of production supporting demand for LulzBot 3D printers. With two to four trained professionals monitoring the cluster at all times, daily production can range anywhere from 1,000 to 15,000 parts and use 45 to 50 kilograms of acrylonitrile butadiene styrene (ABS) plastic in the process. To mark this CES first, we're giving away 16 grand prize bundles (a $1,812.95 retail value)! Each of the Limited Edition LulzBot Mini 3D printers features LulzBot Green 3D printed parts and numbered, laser-etched graphics. NO PURCHASE NECESSARY. Void where prohibited. The LulzBot Mini CES Week Giveaway is open to legal residents of the 50 United States and District of Columbia, excluding FL, NY, and RI, who are 18 years of age or older as of date of entry. Giveaway begins 12:00 a.m. PST 1/9/18; ends 11:59 p.m. PST 1/12/18. For complete official rules and eligibility, visit https://www.lulzbot.com/make-everything Sponsor: Aleph Objects Inc..